Russia and Cuba have agreed in principle to reactive the electronic monitoring station at Lourdes, near Havana, which was abandoned by Moscow in 2001. Officials and Russian military experts say the move is justified by strategic considerations. Russia and Cuba have agreed in principle to reactive the electronic monitoring station at Lourdes, near Havana. Moscow abandoned it in 2001, lacking the means to continue to operate a station thousands of miles from home and under pressure from Washington to make concessions. Now Russia has deemed it necessary to reopen the center. Sited just 150 miles from the coast of the U.S., it enabled the Soviet Union to monitor much of the radio traffic of the “potential enemy”. Russia’s return to Lourdes was confirmed by several sources in the Russian government. Talks with Havana had been ongoing for several years, but Moscow upped the tempo at the beginning of this year (Russian military chiefs held several meetings with their Cuban counterparts), and in the space of several months the parties managed to smooth out all outstanding issues. The arrangements were finalized during Russian President Vladimir Putin’s visit to Havana last Friday. At the same time, Moscow wrote off 90 percent of Cuba’s debt to the tune of roughly $32 billion. The significance of the agreement on Lourdes is hard to overstate. Meanwhile, the Russian Defense Ministry and the General Staff (which will command the center) have yet to issue an official statement. The radio intelligence center at Lourdes began operating in 1967, first under the Soviet Union, then Russia, and continued functioning until 2001, when Moscow withdrew. The decision to return to Cuba may stem from Russia’s increased financial clout, as well as the cooling of relations with the U.S.
Another official described Moscow’s motivation thus: “Our goodwill gesture was ignored [by the U.S.]” Therefore, according to a senior source in the Russian Defense Ministry, Moscow has every reason to revive the project, strengthening its ground surveillance capability to boot. In its day, the facility at Lourdes was the Soviet Union’s most powerful listening post outside the country. It served the radio surveillance needs of the 6th Directorate of the Main Intelligence Administration of the General Staff, the Federal Agency of Government Communications and Information under the President of the Russian Federation, the Foreign Intelligence Service, and the Russian Navy (for communication with surface ships and submarines). Cuba’s current leader, Raul Castro, once stated that up to 75 percent of Moscow’s information on the U.S came from Lourdes. This figure is probably inflated, but the facility did indeed allow the Soviet Union to monitor the airwaves over a large portion of U.S. territory. Today, its utility is even greater, since unlike the Soviet Union, Russia has no signals intelligence from space and no comparable (by number of special vessels) intelligence capability at sea. Sources deny any talk of restoring Russian manpower to its former capacity. In Soviet times around 3,000 personnel served at the complex, and around 1,500 in the 1990s. Technology has progressed since then, reducing the need for so many hands on deck. The cost of restoring and reequipping the center is still being worked out. Until 1992 Moscow used the facility free of charge. November that same year saw the signing of an agreement (“On hosting the Russian radio intelligence facility on the territory of the Republic of Cuba”) under which Moscow leased the station until November 2000, promising to pay $90 million in 1992, $160 million in 1993-1995, and $200 million in 1996-2000. True, most of the time Russia paid not with currency, but rather with supplies of food, timber, fuel, petroleum products, military hardware and related spare parts. 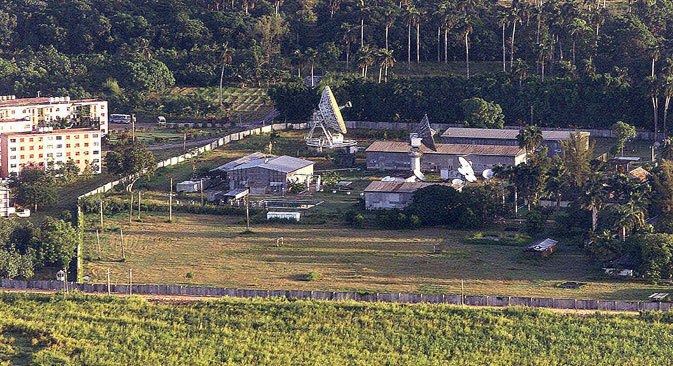 Cuba also had access to information intercepted by the center concerning its own national security. The additional costs of stationing service personnel set Moscow back $100 million annually. In July 2000 the U.S. House of Representatives approved the Russian-U.S. Trust and Cooperation Act, which prohibited the White House from restructuring Russia’s debt until the Cuban facility was closed down. In 2001 the Kremlin took the decision to pull out from Lourdes (and later from the Cam Ranh Bay naval base in Vietnam). The last group of Russian experts left the facility in 2002. Part of its infrastructure was subsequently used as an IT college. “Russia’s return to Lourdes is more than justified,” stated Viktor Murakhovsky, a military expert and retired colonel. According to Army General Vyacheslav Trubnikov, member of the PIR Center and former head of the Russian Foreign Intelligence Service, “Lourdes was the Soviet Union’s eyes in the Western Hemisphere... From that perspective, its loss affected our understanding of the processes taking place in the region,” he explained. This is an abridged version of the original article that was first published in Russian in Kommersant daily.